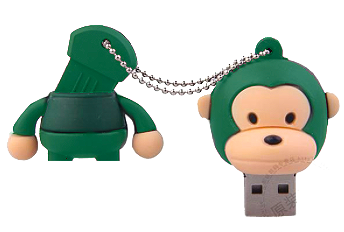 Buy our movies on "Chakra" ... our cute green monkey flash drive stick. 1. ) Simply plug him into any flash drive on your computer and play our movies and 2.) open and print the mini posters anytime and print to your own printer. 1.) "Learning is Fun!" our 60+ minute movie for toddlers and preschool children. Learn to count, identifying objects, the alphabet and much more! Join Wee Bee World puppets ZooGee, Bryon and a cast of characters in a collection of fun and colorful animated videos which will not only entertain, but also help your toddler or preschool child learn and develop. 2.) "Learning Together" (31 minutes) is an educational movie with a collection of individual animated videos starring Wee Bee World's puppets ZooGee and Bryon. Great for helping your toddler or preschooler learn and develop skills to count, perform simple addition, identify objects and learn basic colors. We make learning fun! 3. Mini Poster (8.5" x 11") in full color of the numbers 1 to 100 in PDF format. 4. Mini Poster (8.5" x 11") in full color of the letters A to Z in PDF format. All orders are securely processed using our SquareUp.com account. Shipping via USPS. Thank you for visiting our site. For questions or comments please contact us via email.